I recently attended my second International Food Bloggers Conference in Seattle. It was an inspiring weekend learning new photo techniques, meeting other bloggers, listening to knowledgeable food industry speakers, eating fabulous food and trying new products. This year, it was all about the dairy products for me. Two of my favorite new food items were Noosa Yoghurt and Green Valley “lactose-free” sour cream. I’ve never been a big yogurt fan, but noosa has made one of me. I’m working out these days just so I can guiltlessly devour it. I’m having to pace myself as I could eat it for breakfast, lunch and dinner. And, “lactose free” sour cream. I don’t know about you, but I tend to associate all those “fill in the blank-free” food products as “taste-free” and go out of my way not to buy them. I am not lactose intolerant, so it would never have occurred to me to buy a “lactose-free” sour cream. I was able to sample it at the conference, though, and it was the creamiest, most luscious sour cream I ever did taste. Holy Cow! (literally)- that stuff was good and I went out to Whole Foods as soon as I could to buy some. I have the perfect recipe to compliment that wondrous sour cream. I discovered Mushrooms Julienne last fall on a “Noshwalks” food walking tour of Brighton Beach, Brooklyn. (see my protracted 2013 NYC trip itinerary here). If you’re like me, you may know from watching enough reruns of Law and Order that Brighton Beach is home to a large population of Russian and Ukarainian immigrants, hence the nickname “Little Odessa” or “Little Russia by the Sea”. The main thoroughfare, Brighton Beach Avenue runs beneath an elevated subway trestle. A couple of blocks over running parallel to the avenue and fronted by the ocean is the Brighton Beach boardwalk. Walk west a mile and a half along the boardwalk and you’ll hit the infamous Coney Island. One of our food tour stops was at the large Russian grocery store/ delicatessen emporium, Brighton Bazaar, filled with rows of steaming hot tables to get your stoganoff and chicken kiev and cold tables for your choice of Slavic composed salads including veal tongue in parsley vinaigrette and pickled herring. Myra Alperson, our noshwalks leader expertly scooped up the Mushrooms Julienne for our enjoyment. Absolutely delicious! I came up with my version of Mushrooms Julienne with the help of a couple of good Russian cooking sites: Russian Food and Ruscuisine.com and a fun blog, live laugh rowe . In Russia this is usually served as an appetizer, for the Wilsons it works better as a side dish. Saute the onions in 3 T. butter for 5 minutes in a large skillet. Add the mushrooms and cook for another 20-25 minutes until the juices are decreased and the mushrooms are fully cooked. Salt and pepper the mushrooms while cooking. Make a basic white sauce by melting 3 T. butter over low heat in a large pan. Gradually add the flour while whisking constantly. Slowly add the milk while whisking constantly. The sauce should thicken over the course of a few minutes. Add more milk if too thick. Season with salt and a little pepper to taste. Remove from heat. Mix together the mushrooms, white sauce and sour cream. Add the fennel seeds if desired. To be most authentic distribute the mushrooms among individual ramekins, top with the cheese and broil until the cheese is melted and has started to brown. 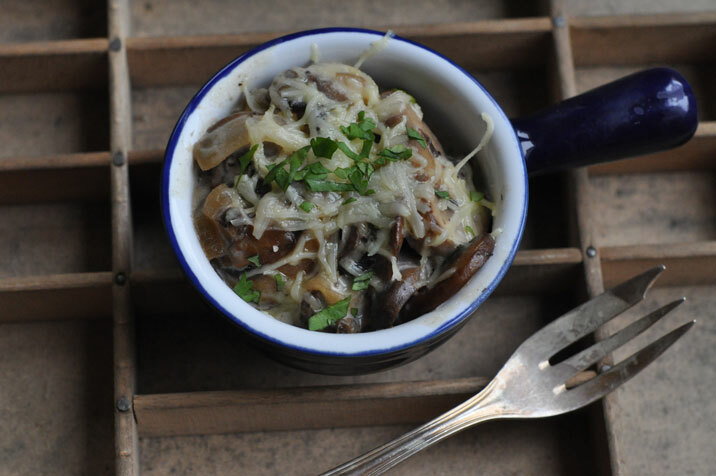 Or, this is what I do.... place all of the mushrooms in a casserole, top with cheese and bake at 350 degrees until thoroughly heated (start with 20-25 minutes) and the cheese is melted and browned. If you are doing this in stages and have assembled the dish the day before (but, don't top with the cheese yet), bake at 350 degrees until thoroughly heated (30-40 minutes), top with the cheese and broil until the cheese is melted and golden brown. I am so excited to try this Joan! I have the most delicious mushrooms from Del & Renee – – love that Del is a prolific forager. I think I’ll serve this as a side dish next to a filet mignon. Yum! And you’ve inspired me to put Brighton Beach on my to-do list next time I’m in NYC.